For someone who dedicates so much time to the superhero comic book genre, I sure do seem to have an affinity for the more quiet and methodical sequences the medium has to offer. 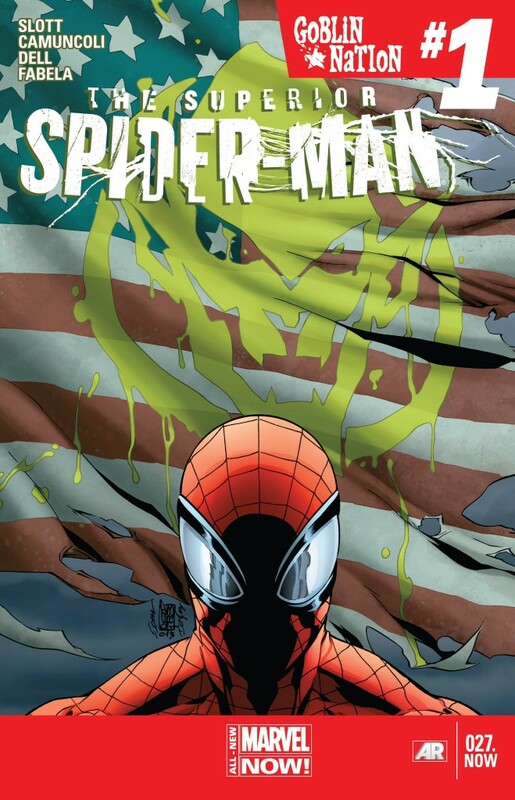 Take Superior Spider-Man #27 (out of sheer principle I refuse to add the word “.NOW” to the end of this title) for example. As the official first part of “Goblin Nation” – an arc that promises a total trashing and breakdown of the Superior Spider-Man’s world – after reading it, my mind keeps going back to one specific scene. 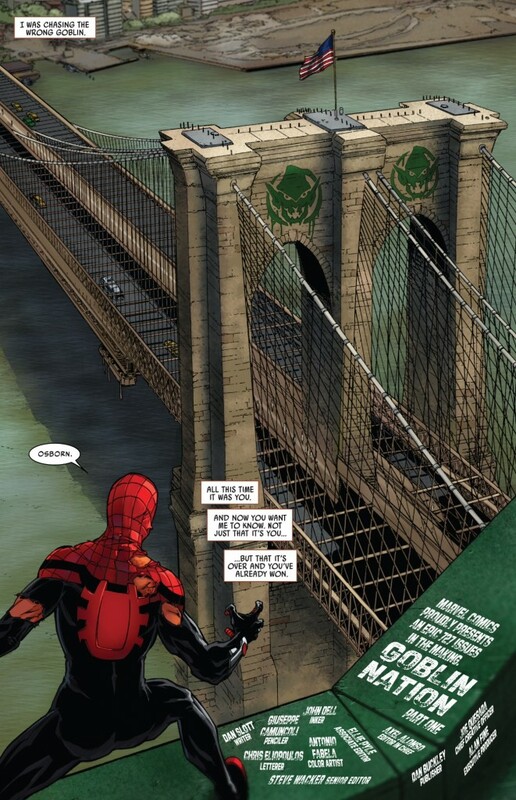 It’s not Spider Ock staring at the Goblin insignia on the side of the Brooklyn Bridge, or Peter Parker’s trippy mindscape entrance into the world of newborn baby boy Otto Gunther Octavius, but rather the scene that shows Spider Ock and the Green Goblin, sitting across from each other at a table, talking. The scene captures very little physical action. Nary a punch is thrown. And until the very last panel, only the Green Goblin is speaking. But for me, it’s one of the most gripping and emotionally satisfying sequences the Superior title has put forward since the series kicked off last year. Rather than teasing readers about a potential Spider-Man vs. Green Goblin showdown and not delivering, writer Dan Slott and artist Giuseppe Camuncoli throw all the cards on the table about what’s to come. The Goblin is well past the point of hiding his plans and intentions. He knows Spider Ock’s secret. 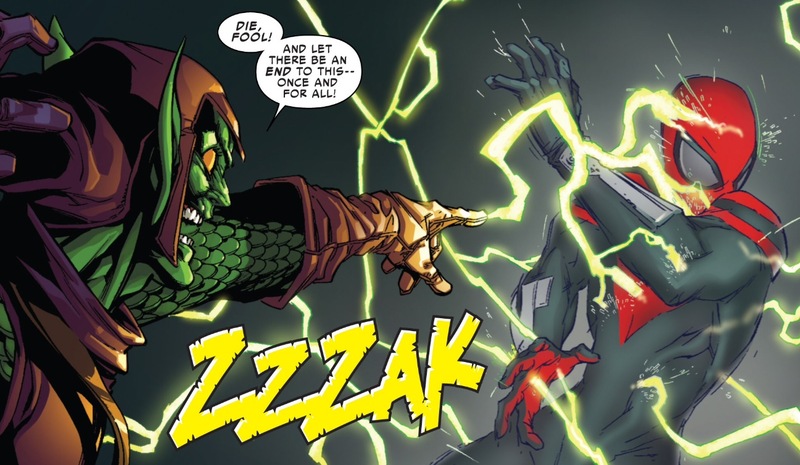 The Goblin is now unquestionably a physical presence in Spider-Man’s life again. 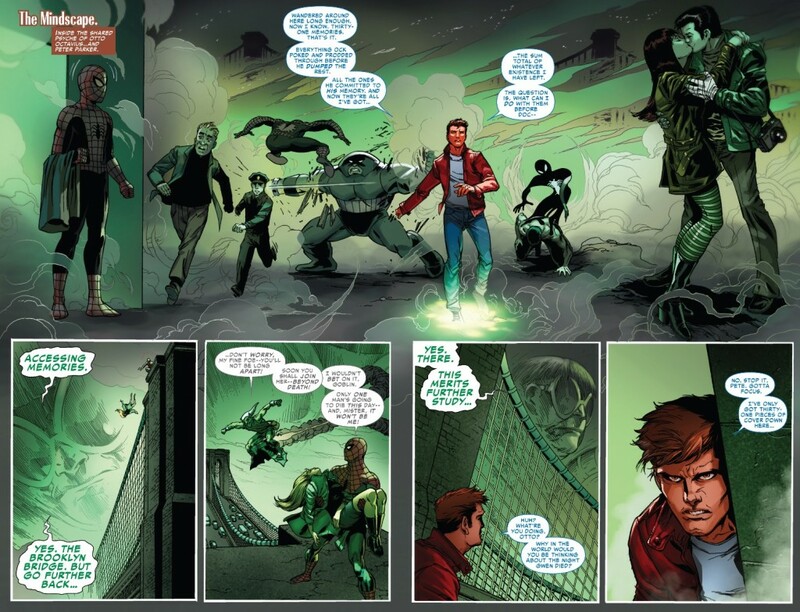 Beyond how it advances the narrative, this scene also allows readers a moment to absorb and embrace the shared history of Spider-Man and the Green Goblin (regardless of who is under the mask, or operating the brains of these characters). Almost every single game-changing, watershed moment in a Spider-Man comic book can be boiled down to Spider-Man vs. Green Goblin (with a few notable exceptions where Doctor Octopus took the place of the Goblin). The “Superior” era has been one of the most unique, craziest periods in the history of the Spider-verse. But even this has been building to Spider-Man vs. Green Goblin. 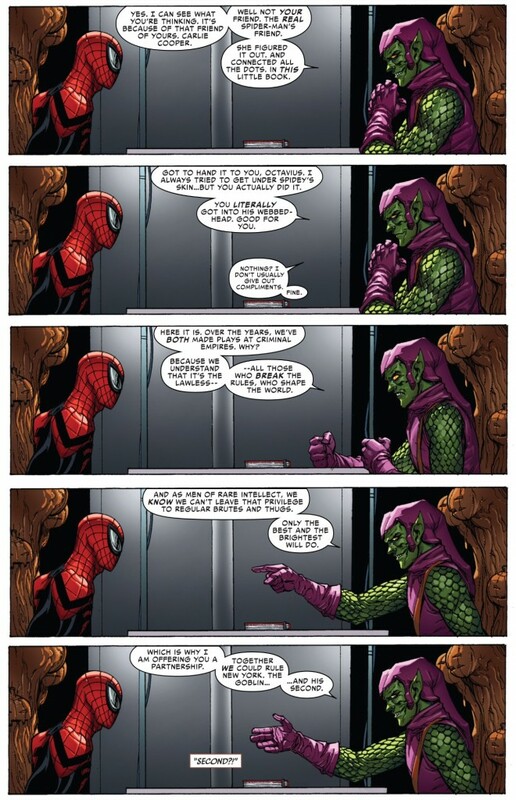 All roads lead to Spider-Man vs. Green Goblin. The quietness of this scene quickly devolves into an action sequence, which aptly ends with the Goblin’s minions blowing Spider Island to smithereens. That’s all well and good, and is to be expected given that Slott and Marvel are in the business of selling comics, and nothing accomplishes that better than high drama and cliffhangers. But I’m so thankful we got this one tiny scene of quiet; a calm before the storm that is certain to be raging through the next four issues. Of course, there are a number of other notable scenes littered throughout this issue that warrant mention. For one, there seems to be a fascination with the number “31.” We open Superior #27’s story “31 days later,” a narrative device that on the surface, doesn’t seem to accomplish much. But I have to imagine future creative teams who may be inspired to write/illustrate miniseries and various point one issues are thrilled to now have a month-long blank slate of Superior Spider-Man continuity to play with. We also find that mindscape Peter has “31 memories” left. Judging from the visual sequence that Camuncoli provides to us, it appears that most of these memories are centered around some of Spider-Man’s greatest historical hits: letting the burglar run by him in Amazing Fantasy #15; fighting the Juggernaut in Amazing Spider-man #229-230; his first kiss with Mary Jane at JFK Airport in ASM #143 (which also manages to keep the idea of THAT romance alive once ASM reboots in April). And as solicitation-readers will aptly note, the Superior series ends at issue #31. After learning this a few months ago, I have been debating its significance. Why not end it issue #33, which could hypothetically mirror the title of ASM #33 “The Final Chapter?” Or go for broke and stretch this to 38 issues in honor of the Stan Lee/Steve Ditko collaboration. For those playing this game at home, ASM #31 of course bears the words “If This Be My Destiny” and it kicks off a three-part series that culminates with “The Final Chapter.” We learned recently that a super-secret book is launching in May that is somehow connected to the Spider-Man universe (a book, that thanks to outgoing editor Stephen Wacker’s hint on the Superior #27 letters page, looks more and more like it’s going to be a Spider-Man 2099 series). So there’s your three-part story right there if you need some more parallels. Just saying. The mindscape portion of Superior #27 actually marks my one moment of trepidation about what’s to come. 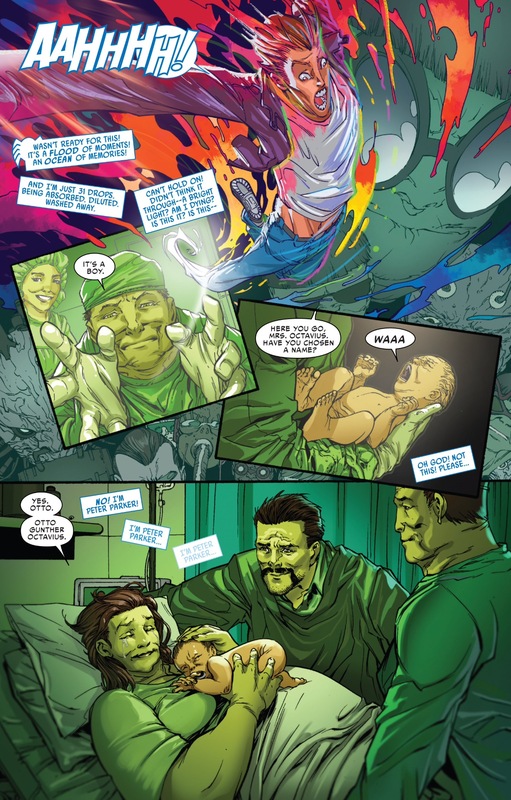 I realize that as a storyteller, Slott needs to continue to turn the screws when it comes to Peter, and how he intends to bring him back, but watching him dive into Otto’s memories and emerging on the other side as an infant Octavius feels a little too been there/done that for me. We’ve already marked Peter’s struggle to escape a body he was unwillingly cast into during the “Dying Wish” arc. We saw how that movie ended. I’m assuming this one will end differently, but do I necessarily need to relive it under somewhat different circumstances? Isn’t the fact that Peter essentially has amnesia and is still too physically and mentally weak to fight Otto for control of his body enough of a challenge? Slott does use Superior #27 as an opportunity to revisit some plot-threads he left dangling during the “Darkest Hours” arc involving Venom. We see that Captain Watanabe is still chasing after Peter, who she believes is connected to the disappearance of Carlie Cooper. We also get a hint from Uatu Jackson that Watanabe’s Wraith capabilities might be compromised by the same Goblin hack that impacted Spider Ock’s spiderbot surveillance technology. Camuncoli’s Jonah illustration is especially ominous and brooding in this sequence, revealing a side of JJJ readers haven’t seen since he was keenly focused on avenging the death of his wife by being there to see Alistair Smythe executed. And I don’t think JJJ has ever come across as this vengeful when dealing with Spider-Man in the past. Remember when I said JJJ was not the guy Spider Ock should tick off? This is it, the beginning of the end for Superior Spider-Man and I for one was engaged the entire issue and for the reasons you mentioned. I for one LOVE that one of the memories Slott kept was that iconic first kiss between MJ and Peter. I have been an advocate of the marriage and the romance so the ineveitable return Slott has set up here is exciting for me. Also I would like to point out if OMD is retconed and the marriage is reinstated they could easily give Peter all his memories involving the marriage (1987-2006) back. 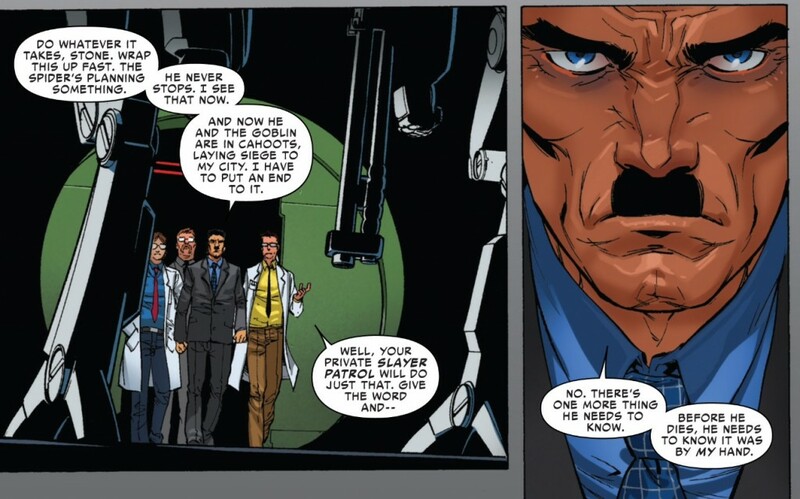 It’s my opinion that since Mephisto took those memories away by resetting the universe or simply just giving Peter new memories of an alternate future, Otto couldn’t claim and erase them during his Parker deletion. So if OMD is deleted these memories will not be affected, giving Pete a good chunk of his life back.